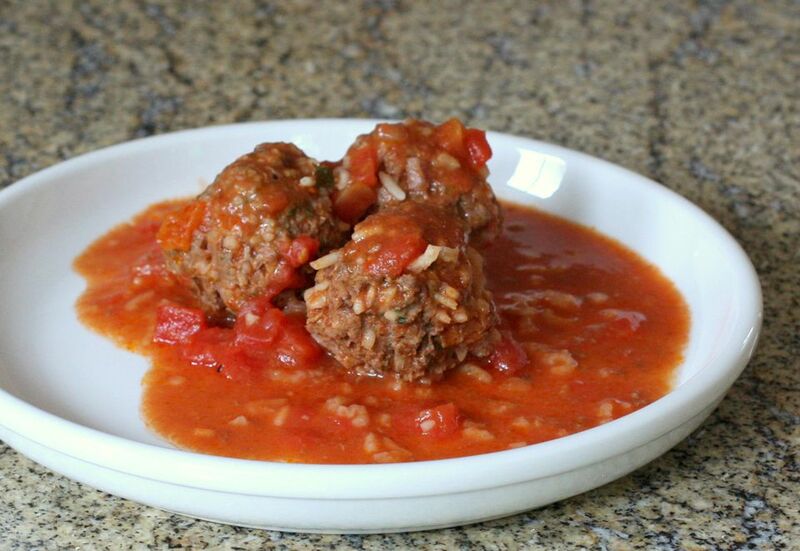 Porcupine meatballs are made with ground beef, rice, onion, tomato soup, and seasonings. Bits of rice sticking out of the meatballs is undoubtedly the reason the meatballs are called "porcupines." This version is made with tomato soup as the sauce. You can add an optional can of petite diced tomatoes to the sauce but feel free to leave the diced tomatoes out of the dish. The meatballs are shaped and cooked in the sauce. The ground beef and rice mixture are similar to cabbage roll stuffing. Top the meatballs and sauce with cabbage wedges or coarsely chopped cabbage for a sort of "unstuffed" cabbage. The sauce also makes a tasty gravy for mashed potatoes. You can easily double the recipe for leftovers, or freeze the meatballs and sauce for a future meal. It's one of those dishes that tastes even better the next day. Combine the ground beef, rice, onion, 1/4 cup of the water, salt, and pepper. Shape meat mixture into 12 to 15 meatballs. Combine the soup, chili powder, and 3/4 cup of water in a large saucepan; bring to a boil. Add meatballs to the sauce mixture. Add a little more water to cover, if necessary. Reduce the heat to low, cover the pan, and simmer over very low heat for about 1 hour. Stir occasionally and add more water, if necessary, to keep the meatballs covered with liquid. Serve the meatballs along with plain boiled or mashed potatoes or noodles. Broccoli is an excellent side vegetable, or serve them with green beans, peas, or corn. Instead of cooking the meatballs on the stovetop, try baking them. Shape the meatballs and heat the sauce mixture. Transfer the heated sauce and meatballs to a baking dish. Cover tightly with foil and cook in a 350 F oven for about 45 minutes to 1 hour. For a low carb option, replace the rice with cauliflower "rice." Replace the rice with quinoa or use instant rice. Add 1/4 cup of finely chopped green bell pepper to the meatballs along with the chopped onion. Omit the tomato soup and add 1 large can (15 ounces) of tomato sauce. Reduce the water to 1/2 cup. Add 2 teaspoons of Worcestershire sauce to the tomato sauce mixture. Add 1/8 to 1/4 teaspoon of garlic powder to the meatball mixture.